The Lord of the Rings by J.R.R. Tolkien. Maybe cheating because I have heard Tolkien considered this ONE book in three volumes… however I did also just read The Hobbit, so I guess… it does count! Well, it has been a long time since I read LOTR, but I think I would like to say the first book, The Fellowship of the Ring, was my favorite of them. 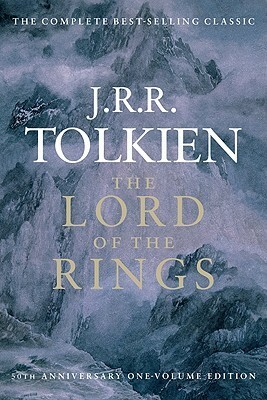 I feel this way because, like I’ve said in other posts, I’m not a big fan of fantasy in general, and (after watching the first movie), this first book completely enveloped me into the Middle Earth world and I read the other two based on my feelings about this first one. It was like Old Toby, the finest weed in the Southfarthing. I was like a hobbit with Elvish lembas (can’t just eat one). I was all like, “It comes in pints? ?” (okay, enough!) Well played, Tolkien. Well played. This entry was posted in books and tagged 30 day book challenge, adventure, fantasy, fiction, literature by kristin @ my little heart melodies. Bookmark the permalink. Yeah! I was a little bit at a loss with the “series” question, but LOTR works for me! I’ll probably have to wait until the week of Christmas to see the new Hobbit movie. I remembered over the weekend that I was completely hooked on the V.C. Andrews Dollenganger Series when I was in middle school (“Flowers in the Attic,” etc.)! My favorite of those was definitely “Flowers in the Attic,” the first of the series.